Kids can hop from the Congo Gorilla Forest to the Himalayan Highlands to the African Plains to see a whopping 4,000-plus animals in naturalistic environments. Special attractions include camel rides (seasonal), the Skyfari (glide over the zoo for a bird’s-eye view of the animals), daily feedings, and the new Tiger Mountain exhibit, featuring Siberian tigers. Adults $11, children $8, kids under 2 free. 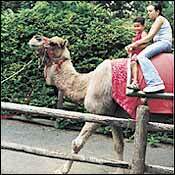 The Central Park Zoo has been home to animals large and small, two- and four-legged, furry and slimy, since the 1860s. Today, kids can befriend penguins, polar bears, and parrots. Tisch Children’s Zoo offers educational programs for the littler ones, from touch time (play with turtles, hedgehogs, frogs, ferrets, lizards) to overnight pajama parties, where zookeepers teach kids the care and nocturnal behavior of the animals. Adults $6, children $1, kids under 3 free. The oldest aquarium in the U.S. has everything under the sea. Check out the “Alien Stingers” exhibit, featuring jellyfish, sea anemones, coral, and other stinging seafarers. Whales are an enduring favorite, as is the Aquatheater production, starring sea lions that do their best to splash the audience. Adults $11, children $7, kids under 2 free. Prospect Park focuses on educational exhibits that promote wildlife exploration. Children can watch baboon families interact in their natural environment, walk among prairie dogs and red pandas, or feed barnyard friends such as goats, alpacas, and, a favorite, Aggie the cow. Adults $5, children $1, kids under 3 free. Go see the ten adorable new prairie-dog pups at the city’s biggest zoo. Born at the beginning of the summer, they’re now big enough to chase each other around the zoo’s Prairie Dog Town. With its predominantly American flavor, the Queens Zoo is home to animals you would otherwise need to drive cross-country to see: California sea lions, American bald eagles, bison, and mountain lions. The buildings housing the zoo’s four-legged tenants are interesting in themselves. The aviary, for example, is a geodesic dome originally used in the 1964 World’s Fair. Adults $5, children $1, kids under 3 free. This lesser-known attraction is a mutt of sorts: part aquarium, part tropical forest, part pony barn, part African savannah, and part animal hospital. Exotic residents include baboons and leopards. There’s also a children’s petting zoo. Adults $5, children $3, kids under 3 free. Dating back to 1697, this working farm is home to an orchard, an herb garden, and lots of goats, sheep, cows, chickens, and pigs. Families can tour an eighteenth-century farmhouse, take a hay ride, and see the inner workings of a greenhouse. There’s also a corn maze and a pick-your-own-pumpkin patch. Don’t miss the annual County Fair (9/18–9/19), with blue-ribbon competitions and pig races. Admission is $5 for grown-ups, $3 for kids 12 and under; non-event days are free. 250 Old Country Rd., Melville, N.Y.
About an hour from Manhattan, White Post Farms is an animal lover’s heaven, with traditional pony rides and a good-size petting zoo (the baby goats and lambs are the most popular). For grown-ups, White Post offers the Craft House, the Fruit and Vegetable Market, and a greenhouse. Admission is $4 per person.